Congrats Dustin! I’ve sent you an email to collect your shipping address. Huge thanks to everyone who entered my giveaways this year, and keep your eyes peeled for 52 more in 2019! Posted on December 29, 2018 by Brad Dowdy and filed under Galen Leather, Giveaways. It’s Christmas day, so let’s go big! Galen Leather has been a great supporter of the site over the years, and they recently sent me ANOTHER beautiful Writing Box recently - so let’s give it away! I have one of these on hand for you - just the box though, you will have to fill it up with all of your stationery goodness. Read the rules below and enter away! Posted on December 25, 2018 by Brad Dowdy and filed under Galen Leather, Giveaways. 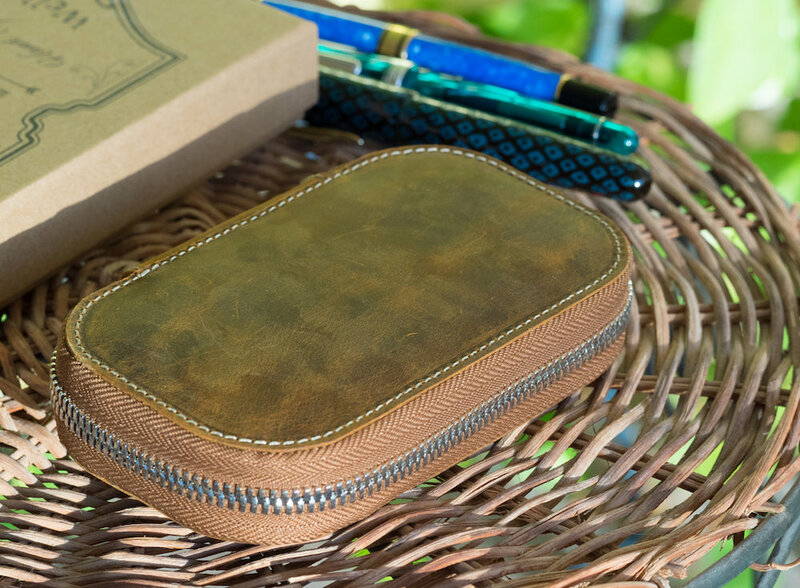 Galen Leather makes gorgeous leather products and other accessories for the analog-minded. For my birthday, I asked my husband to purchase a Galen Six Pen Case in Crazy Horse Brown leather. I liked the design with the zip closure which I hoped would offer a better level of protection than a roll case. The case comes in a Galen cardboard box. Included inside are a card with the craftsman's name, information about Galen leather, an evil eye talisman, a packet of Turkish coffee and a tea bag. I love these extra touches in their packaging. The case is absolutely gorgeous. I really like the weathered look of Crazy Horse Brown leather. The zipper is super thick with a leather pull attached. Inside are three elastic pen slots on each side. 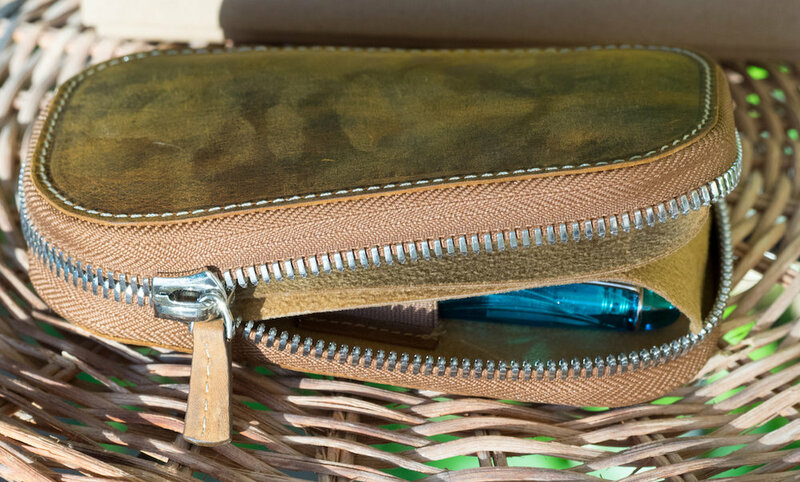 Leather flaps cover the pens to protect them from knocking against one another when the case is closed. All of this is fabulous--until you put pens in the case. The elastic slots hold the pens securely. However, I encountered several problems. First, pens longer than 5.5 inches do not really fit in the case. For example, my Danitrio is simply too long (and fat) for this case. 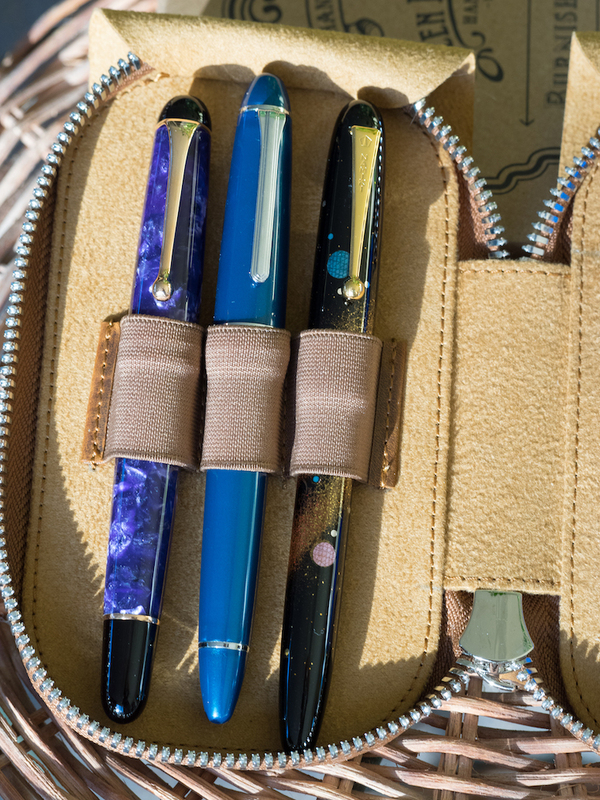 Second, if the pens are large in diameter, the leather flaps don't completely cover the pens to protect them, and the pen case itself can't be zipped closed. In this photo, you can see how the leather flap meant to protect the pens is forced up. Even if you push it down, it doesn’t cover the bottom third of the pens. Third, even if you fill all six slots with pens of ordinary size, the case will not close completely—at least I wasn't willing to try to force it closed. When I say pens of ordinary size, I'm talking about typical-sized fountain pens, such as Platinum, Pilot, Aurora, and Sailor. What I discovered is that this case works great with just three pens, but if you try to fill all the slots, you run the risk of the pens scratching each other since the leather flaps don't fully cover them. Worse, you can't completely close the case. While I realize that leather can stretch, I doubt it can stretch enough to make the case useable for me—and who wants to risk using their pens to stretch out the leather? Perhaps Galen could use some elastic along the zippered portion that would allow the case to expand to accommodate six regular-size pens. I'm not sure. But, in all honesty, I feel uncomfortable putting more than three pens in this case, which obviously means it's no longer a six-pen case. That said, I looked at the reviews of the six-pen case on Galen's website, and most people were quite happy with it. One or two said that the case doesn't accommodate larger pens, but no one discussed the case not closing properly. Maybe those reviewers use smaller-sized pens. I will probably return my six-pen case and purchase a version that has pen slots on one side only. Even though this six-pen case didn’t work for me, if you use smaller pens (I’d say pens equivalent to Pelikan M400 size), it should work well for you. The craftsmanship is truly exquisite--there’s no doubt in my mind about that. The case is reasonably priced at $45.00, and you can have it personalized for $10.00 more. Posted on November 30, 2018 by Susan Pigott and filed under Galen Leather, Pen Case.